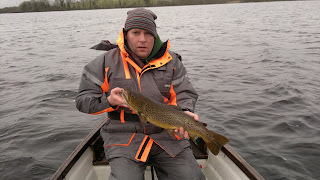 The club will hold an open competition fishing for the Donnellan Cup on Oakport Lake from 10am to 4pm on Sunday 26th of Feb 2012. The club will hold an open competition fishing for the Boyle and District Angling Club Perpetual Shield on Lough Skeen from 10am to 4pm on Sunday 12th of Feb 2012. Note: Membership now due for 2012. A few members had there first outing of the new year last Sunday. The pike were very slow, but it seems trout were feeding all day & not just on fly as this nice fish to 5pd shows. Caught on a 1/2 pd mackerel ! Weighed & released within a few minutes. The Club AGM will be taking place on Friday, Jan 20th in the Clubhouse @ 9pm sharp. All members please attend. This publication attached may be of interest to all, its seems to show the upper shannon as closed to Salmon fishing & outlawing the use of worms on same. Didn't know there were Salmon back here! Also shows us as part of the Limerick District? Open the following file on the link below.